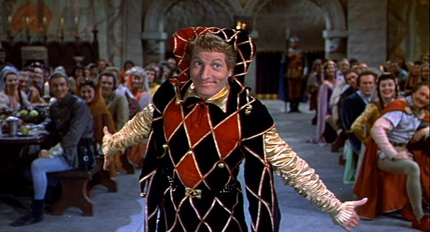 On a rainy evening at the beach, I pulled out a DVD of one of my favorite Danny Kaye movies, The Court Jester. Our group consisted of adults in their 40s, several teenagers, and a six-year-old, but none of them had ever seen the film before. Most of them knew Danny Kaye as "that guy from White Christmas," which is a heart-warming Christmas classic that pairs him with Bing Crosby and certainly showcases Kaye's talents at singing and dancing and making you laugh. This movie does that, as well, but also reveals one of Kaye's most impressive talents (and he had many): his ability to turn tongue twisters into high-speed, comedic, colloquial roller coasters. Set in medieval times, presumably in England, an evil despot has usurped the royal family's throne and made himself king. His henchmen have dispatched the entire royal bloodline, but a baby who is heir to the throne was saved by a group loyal to the crown and they are protecting the baby who would be king. His majesty, the baby, is identifiable by a birthmark on his bum that bears resemblance to a scarlet pimpernel. The Black Fox, a Robin Hood-like character, is leader of the underground movement that is trying to restore the rightful heir to the throne. The Black Fox's ranks have recently been joined by a former carnival performer, the mild-mannered Hubert Hawkins (Danny Kaye). Hawkins and the lovely Maid Jean (Glynis Johns), a captain in the loyalist movement, are given the assignment by the Black Fox to transport the child to an abbey in Dover for safekeeping. One thing leads to another, and Hubert and Jean accidentally run into Giacomo, "the king of jesters and jester of kings," who is on his way to the palace. Maid Jean concocts a plan to knock out Giacomo and send Hubert in his place to the palace so that the opposition forces can gain access to the castle via a secret tunnel, the key to which Hubert, disguised as Giacomo, will secure from the king's chambers. This is a pretty good plan, except they don't know that King Roderick's right-hand man, Sir Ravenhurst (Basil Rathbone), has actually hired Giacomo as an assassin to kill off some knights in the king's court. Further complicating matters is the king's daughter, Princess Gwendolyn (Angela Lansbury), whom the king wants to marry off in a political alliance with Sir Griswold of Mackalwane. She wants to marry for love, and for a number of reasons becomes convinced that she is love with Giacomo and he with her. One of the reasons is the meddling of her servant who is also some sort of a witch, Griselda (Mildred Natwick), who is pretty effective at both casting spells and mixing up potions. She casts a spell on Giacomo that is activated by the snapping of the finger, and he alternately believes he is a powerful swordsman, a great lover, and the hapless Hubert. We also get to enjoy Kaye's musical comedy genius as he performs for the king as part of his silly subterfuge. "I was battered and bruised but the king was amused and before the siesta he made me his jester and I found out soon that to be a buffoon was a serious thing as a rule! For a jester's chief employment is to kill himself for your enjoyment, and a jester unemployed is nobody's fool!" And so it goes for over an hour and a half. A story full of action, adventure, romance, and comedy that is still just as much fun as it was when it was released in 1956. Danny Kaye was a national treasure, and The Court Jester was certainly one of his crown jewels. Everyone in our group, young and old, laughed and laughed at the timeless antics, and the next afternoon when the rain returned, the youngest member of our viewing audience put the movie back in for a second show. Clearly, she is also nobody's fool.